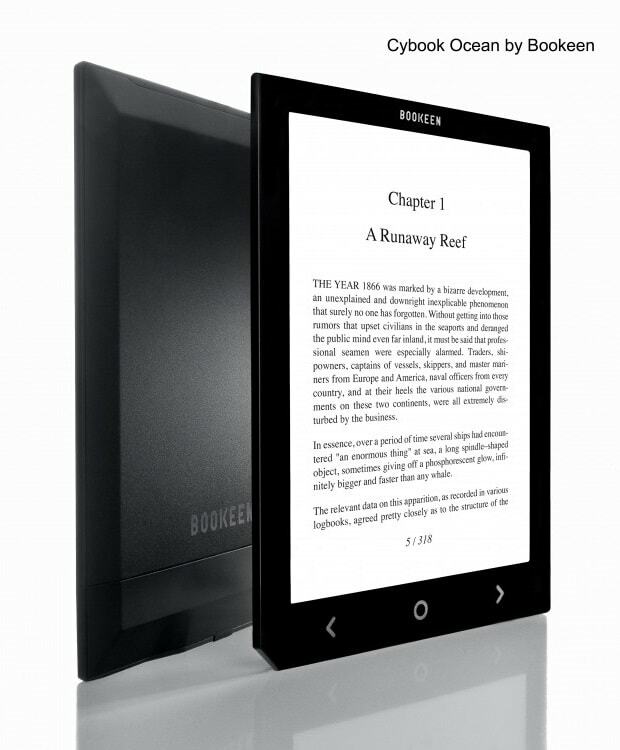 It's been just over a month since Bookeen teased us with the news that they had an 8" ereader in the works and today we finally got a look at it. The Cybook Ocean has an 8" screen with a resolution of 1024 x 768 (close to the same as on the latest 6" screens). It comes with 4GB Flash storage and a microSD slot. Battery life is expected to be around 10 weeks, though it's not clear whether that is with the frontlight on or off. As you can see, the Ocean has a blocky design that is almost as angular as the new Kindle Fire HDX. It has a matte black and a glossy front. The Cybook Ocean has Wifi, a touchscreen, and an on-device ebookstore. It's expected to ship next month with a retail of 160 euros. As I noted when I covered the Cybook Ocean last month, that price is 20 to 30 euros more than the competing 8" models on the European market, neither of which have a frontlight or a touchscreen. The Cybook Ocean is also priced about 10 euros less than the Kobo Aura HD in Europe. Given that the Aura HD's 6.8" screen boasts a significantly higher resolution the extra cost could be worthwhile. This is interesting for PDFs & the price is good. Would you know how Bookeen’s firmware handles PDFs? Does it have, for example, the capabilities of the Kindle Paperwhite (e.g. highlights, export, zoom etc.)? I think Onyx recently released one and they, oddly, release different operating systems for each of their devices! The PDF handling on that one was similar to the DX! Sorry just checked, it wasn’t Onyx but the Icarus 8. But the most important question is: Does it have e-ink screen??? It has the “knockoff” screen from OED technologies. and second: normal pdfs, where reflow function is highly useful. I am quite satisfied with the product. I only miss the center page option for pdfs and also OED screen shows some dirty (gray) pixels in some places. Translations into polish language are also not ideal 🙂 I can accept those issues and live with it, because from my point of view there is no better product right now on the market! As far as I know Bokeen 8 will use identical OED screen just like Icarus 8.